Businesses from across Shropshire met to discuss opportunities for growing their global export markets in the post-Brexit economy. Telford based Global Freight Services Ltd, which has been shipping goods around the globe for more than 20 years, joined forces with business leaders to host the event at the Marches Growth Hub in Telford. 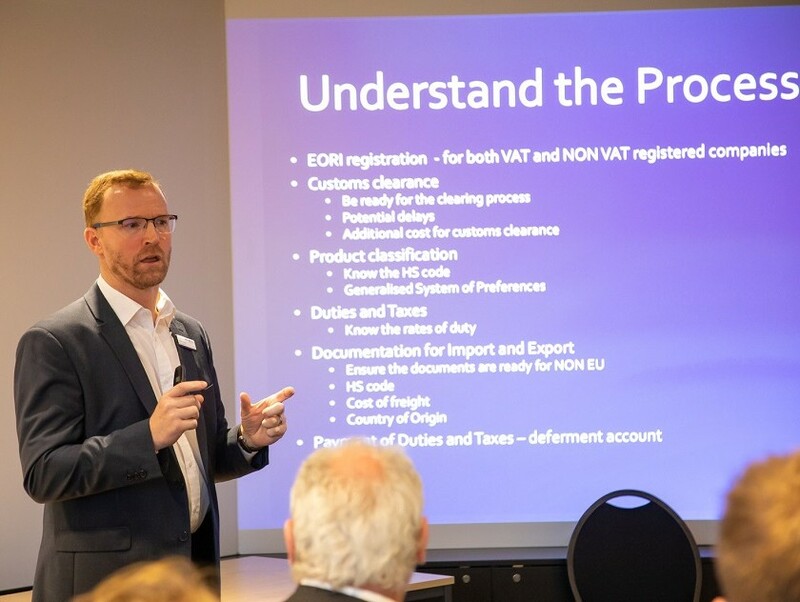 The free event, which unintentionally coincided with a crucial series of Brexit votes in Parliament, was attended by more than 30 business owners eager to identify new overseas trade opportunities. Those attending heard from Dan Hunt, a wealth consultant for Barclays, about the current economic climate whilst Norman Rikunenko from the Department for International Trade provided advice to businesses on the latest Government guidance for trading overseas. Anton Gunter (pictured) managing director of Global Freight, talked to firms about what they should be doing to prepare for Brexit, deal or no deal, and highlighted a number of opportunities for expanding their overseas markets. He said: “Brexit is happening and we need to get on with what we are doing. There are positive and practical steps around registrations and customs procedures which businesses should be taking to prepare for departure. “They should be looking at classification codes and trade tariffs and talking to experts if they are unsure of anything. “It is also a good time for businesses to start looking outside of the EU and grow their markets on a more global scale. “Our advice is for companies to think about ‘third countries’ - those countries located outside of the EU and to harness new supply chains. There are some fantastic opportunities out there. Mr Gunter is predicting a short-term Brexit smog but believes businesses are resilient enough to survive and come out the other side as they have done following the financial crisis. Those attending the international trade event also heard from Tim Luft, from VR Simulation Systems, on how to go about generating growth internationally. And, Peter Wilding, Brexit Director at Shropshire law firm FBC Manby Bowdler, urged companies to look at employment contracts and product compliance regulations in preparation for Brexit.